Xerox ColourQube 8870 Ink Cartridges At InkNTonerUK we offer the finest printing consumables around with 100% affordability! With us, your NEW Xerox ColourQube 8870 ink cartridges are incessantly offered at the LOWEST possible costs possible at that time, and will never cease to please! 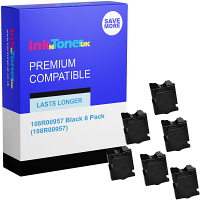 The InkNTonerUK team do all we can to provide the most economical Xerox ColourQube 8870 ink cartridges yet certify that the quality of these cartridges will ALWAYS be of the highest possible standards, to leave you with nothing but superlative results, with EVERY print job! When utilizing your newly purchased Xerox ColourQube 8870 ink cartridges, you will be producing incomparable prints, at substantially swift paces of UP TOO; 40 PPM (Prints per minute) in both Mono (B/W) and colour with a selection of varied media types to print on, for a range of deviating purposes. These media types primarily include; Multiple sizes/textures of paper transparencies etc... As money-spinning as your NEW Xerox ColourQube 8870 ink cartridges may be, they aren't the only cost-effective benefit associated with the ColourQube 8870 printer! The Xerox ColourQube 8870 printer also happens to be 'Energy Star' qualified, making it a product of LOW energy consumptions, resulting in the reduction on energy bills, positivity for the environment, and together with your ColourQube 8870 ink cartridges will save you more of your hard earned cash! So what's stopping you!? The Xerox ColourQube 8870 ink cartridges as well as any other product we vend will be nothing less than of the utmost premium quality achievable, and of the LOWEST possible cost! They are eminently LONG-lasting, making the overall maintenance of your Xerox ColourQube 8870 printer an overall more gratifying yet less frequent event! We recommend that you 'Bookmark' this page now, as by doing this you will forever be just one comprehensible click away in being directed right where you are now, each and every time you entail the acquirement of your NEW Xerox ColourQube 8870 ink cartridges, and MANY more!